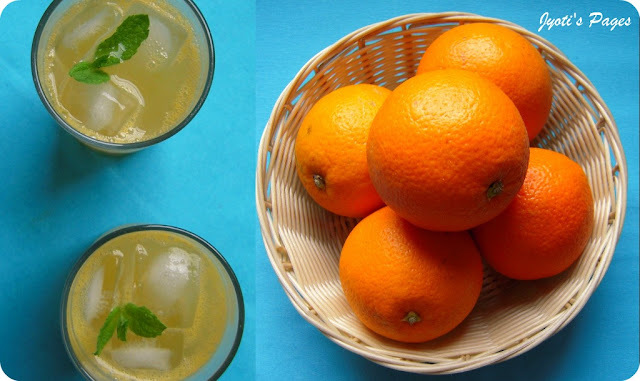 Jyoti's Pages: Orange Spritzer ~ Homemade Fanta ~ India Calling! Finally the day is few hours away! Some times back, I had mentioned in one of my post that I will be going to India soon and that is the day I am talking about. I am flying to India tomorrow! Yayy! Days have been busy of late, as I had been preparing for this trip. Finishing reading books I had brought from library, returning unfinished books, shopping, preparing lists for India shopping, packing and preparing the home for DH as he will be making this trip 2 weeks later, cooking things to finish up vegetables from my pantry (and clicking them as well, watch out this space for recipes in coming days)! So, this space has been silent for a couple of days now. Today I have chosen to post this refreshing orange drink which I like to call Orange Spritzer, When, I served this to my DH, he said it is just like Fanta! To add a little here, we both love Fanta! 200ml of freshly squeezed orange juice. (About 3 oranges). 120 ml or more chilled soda water. Sprig of mint to decorate. 1. In a jar mix add orange juice,lemon juice and sugar. Stir well. 2. Add ice cubes to two tall glasses. Pour the prepared mixture. 3. Top it with chilled soda water and stir. Add a sprig of mint and serve immediately!Enjoy! This drink is perfect for hot days. Perfect to beat the heat. Here is one glass for you! Thanks for stopping by! Cheers. P.S. I will be back soon with posts from India. Till I write again, stay tuned! Labels: Beverages, cool drinks, Drinks, Orange drink, orange mockltails, orange spritzer. Have a wonderful trip and will be looking forward to hearing all about it on your return. Safe travels. awesome drink...homemade!! yum and refreshing! Have wonderful holidays..and this drink looks great...the colour is beautiful and pics are gorgeous. This one looks so fresh and appetizing...feels like having a glass now. have fun on ur hols & the drink looks refreshing !